I recently finished reading Bruce Lincoln’s newest English-language book, Between History and Myth: Stories of Harald Fairhair and the Founding of the State. It was neither an easy nor a quick read–due only to my ignorance of the materials at issue–but its richly detailed analyses were ultimately well worth the time and attention. Like his other work I’ve read, this book was not just informative, but also incredibly thought-provoking and challenging. I look forward to reading it again, as I’m positive it will be equally rewarding the second go-around. Based upon a close reading of the many variants of the stories detailing the death of Halfdan the Black and the vow of his son, Harald Fairhair, to unify Norway, Lincoln takes to task his own provocative claim (which he describes as “a flippant sentence I wrote in a moment of weakness” ) that “[i]f myth is ideology in narrative form, then scholarship is myth with footnotes.” In place of this near-mythic utterance, he distinguishes with sophistication and clarity (and charts!) 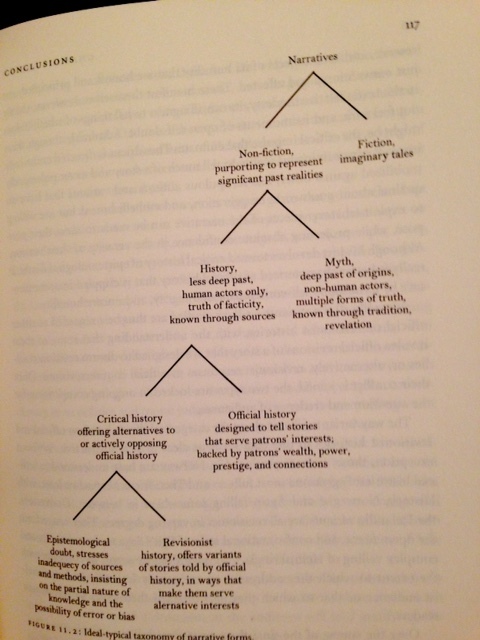 several ideal types of non-fictional narratives. Within non-fictional narrative, he theorizes history and myth; within history, official history and critical history; within critical history, revisionist history and a type of history to which he does not give a name. See the image below for more detail. “In an ideal world,” Lincoln later writes, “official histories ought to be vanquished by revisionisms [if only because the former tend to whitewash harsh realities; think Benjamin here], and revisionisms ought to yield to epistemological doubt” (119). This is unlikely on his view, however, because non-fictional narratives fashioned on the foundations of skepticism (toward both self and evidence) and humility–though perhaps best approximating that ever-elusive goal of intersubjective veracity–often aren’t that exciting or memorable (except, perhaps, to historians who hold themselves to the same principles of method). Put another way, but making the same point: the more liberties an author takes, the more intellectually satisfying and memorable a narrative can become. And with this comes more staying power, more gravity, more tellings, more audiences, more variation. And with this, finally, comes significant utility for those seeking to maintain power, to offer subtle criticism of those in power, or to seize power for themselves. To reiterate what I’ve said above, in more colloquial language, this book is damn good. 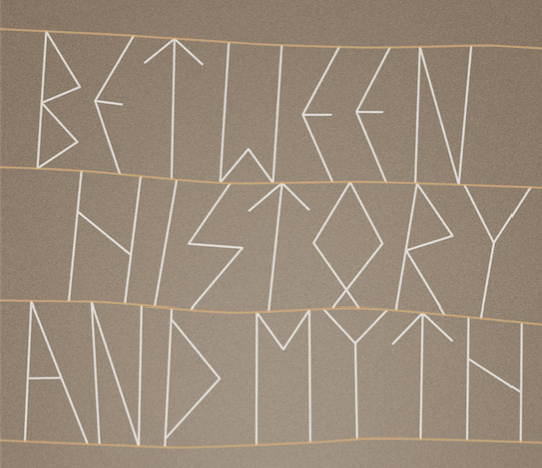 Those interested in Norse/Norwegian history/historiography will likely find it insightful (though I can’t speak to the particulars, as I am not a specialist), as will those interested in thinking broadly about issues of narrative, history/historiography, myth, and related categories. 10/10 will read again. Adam T. Miller is a PhD student in History of Religions at the University of Chicago, an online instructor for Central Methodist University, Editorial Assistant for History of Religions, and Associate Editor of the Bulletin for the Study of Religion. Typically operating within socio-rhetorical theoretical frameworks and employing philological, discourse-analytic, and historical methods, his research interests tend to be all over the place. He plans to specialize in the history and literature of Mahāyāna Buddhism in India (going into Vajrayāna and Tibet, as well), but has written on and maintains a strong interest in such topics as Swami Vivekananda and Death Grips. He occasionally updates a personal blog, an academia page, and a twitter account. This entry was posted in Adam Miller, Book Reviews, Religion and Theory, Theory and Method, Uncategorized and tagged Adam T. Miller, Bruce Lincoln, Halfdan the Black, Harald Fairhair. Bookmark the permalink.